I couldn't come up with a good W word for alliterative purposes, so it's "M" once again. 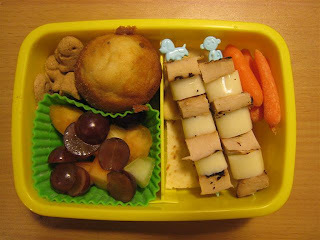 I really think part of the catch to speeding up the whole bento packing issue is making the kids eat the same lunch. I can pack things much quicker if I'm not having to make two separate meals. The other part involves leftovers and/or freezer stashes. 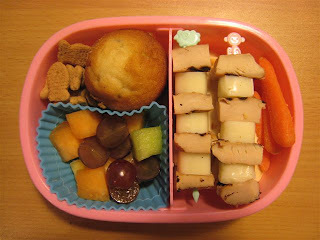 For today's purposes, I combined same lunch with leftovers, leaving me with a very quickly finished lunch. F&B had grilled sesame chicken and cheese skewers (chicken leftover from a Thai restaurant the other night). Underneath that, thought it is hard to see, is a flat bread stuffed with roasted red pepper and white cheddar cream cheese. They also have carrot sticks, a mini blueberry muffin, a cup of mixed fruit (canteloupe, pineapple, honeydew and grapes), and a few cinammon goldfish to fill in a gap in the boxes! Cute! I love the skewers!